Twenty five years ago the nation was singing along to Sir Cliff Richard’s Saviour’s Day, a song which became the Christmas Number One in 1985. It was written by a song-writer who inspired me as a young Christian. Chris Eaton became a familiar name, not only writing many of Sir Cliff’s music, including O Little Town; but he penned many a tune sung by international Christian singer/song writer Amy Grant, whose poignant and moving songs helped me through my teens and early 20’s. Something also significant happened in Stroud 25 years ago. I was fortunate to be in the very meeting where the name The Door was agreed and the seeds of the charity baring that name, set up by Brendan Conboy and Andy Morris, was born. 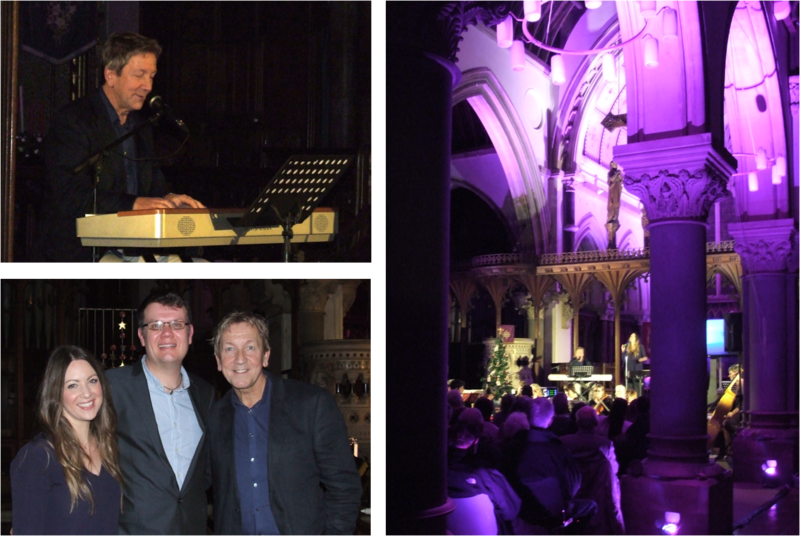 It was rather special then to be part of Christmas Presence 2015 – A Very Vintage Christmas at St Laurence Church in Stroud, where Chris Eaton and his wife Abby Scott took us on an enchanting journey from Christmas past to Christmas present in aid of The Door Youth Project, which has helped thousands of young people find purpose, hope and develop life-changing skills. Organised by The Door and Ignition Gloucestershire, it was the third festive event of its kind which delivered an excellent night of music, with high quality singing, accompaniment and orchestral talent. Back in 1987, as a singer in the sixth form choir, I watched as a fellow 18 year old showed immense promise when he conducted his peers. It was a pleasure to see that same young man, my friend Jonathan Trim, lead a Stroud Ensemble Orchestra with such ease and passion throughout the evening. Christmas Presence 2015 provided an oasis in the midst of what can be an exceptionally busy time of year. With five excited daughters, endless nativity plays, carol concerts, plays and all the extra pressures Christmas can bring, I made the point of coming to this event. Why? Because I knew it would help me remember what this festive season is all about: His presence. Without it, Christmas is just another event on the calendar. Yet taking the time out to let the sincere and heart-warming lyrics sung by Chris and Abby sink in, highlighted the joy of the season and of course the greatest gift we can all enjoy, if we learn to receive. It certainly started off my Christmas. It was a treat and privilege to be there.